Sporting KC – Page 222 – Welcome to Wyandotte Daily! Sporting Kansas City announced on Tuesday that the club has agreed to transfer midfielder Oriol Rosell to Sporting CP in Lisbon, Portugal. Sporting Kansas City will receive two-thirds of the transfer fee to use as allocation money per MLS rules, as well as a percentage of any future transfer of Rosell from Sporting CP to another club. Rosell, 21, joined Sporting Kansas City in August 2012 from Barcelona B. He contributed two goals and two assists in 49 MLS appearances (including postseason) and led all MLS players with 130 interceptions during the 2013 season. Rosell was voted No. 14 on MLSsoccer.com’s top 24 players under the age of 24 last year and made his international debut for Catalonia in 2013. Sporting Clube de Portugal were runners-up in the Liga ZON Sagres this season and will compete in the 2014-15 UEFA Champions League. The team features two-time MLS All-Star Fredy Montero, as well as four players on national team rosters for the 2014 FIFA World Cup: Islam Slimani (ALG), Marcos Rojo (ARG), William Carvalho (POR) and Rui Patricio (POR). Rosell becomes the third Sporting Kansas City player in the last 18 months to move to Europe. In 2013, Honduran midfielder Roger Espinoza joined Wigan Athletic (England) and Sierra Leone striker Kei Kamara was transferred to Middlesbrough FC (England). Rosell’s transfer will open a Salary Budget Player spot and international slot on the Sporting Kansas City roster. Sporting Kansas City fell 1-0 at D.C. United on Saturday as Fabian Espindola’s 28th-minute goal snapped his club’s seven-game winless streak in the series dating back to 2010. D.C. United goalkeeper Bill Hamid matched his season-high with five saves to earn the clean sheet in a match that saw Sporting KC outshoot the home side 16-7 at RFK Stadium. The first shot of the game for either side came in the 18th minute as Espindola sent a cross from the endline that connected with Nick DeLeon, whose header from eight yards out was straight at Eric Kronberg. Just over a minute later, Palmer-Brown — the youngest player in MLS at age 17 — did well to thwart Designated Player Eddie Johnson with a sliding stop inside the area. D.C. United took the 1-0 lead at the 28-minute mark on Espindola’s seventh goal of the year since being acquired from New York in the offseason. The Argentine cut in from the right touchline and floated a left-footed curler inside the far post that evaded Kronberg to stretch his goal-scoring streak to three straight games. After allowing the team’s first goal from the run of play in the first half this season, Sporting Kansas City responded with four scoring chances before the halftime break. Jacob Peterson directed a first-time shot on frame in the 34th minute, his 10,000th minute of MLS action (including postseason), that Bill Hamid was well-positioned to smother. The final opportunity to level the score came in the final minute of the half after a trademark piece of combination play between Antonio Dovale and Paulo Nagamura. Nevertheless, Dovale’s shot was ultimately blocked at the top of the area by former KC captain Davy Arnaud. In the second half, D.C. United was held to just four shots — and none on target — but threatened in the 50th minute when Arnaud played Espindola behind the Sporting KC backline. Kronberg was alert to the danger and quickly darted from his line to take the ball off the foot of Espindola. 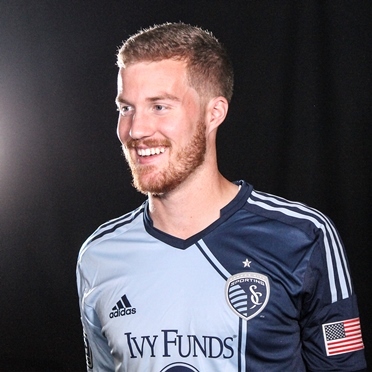 Feilhaber’s free kick in the 63rd minute connected with Peterson for a flick header that carried wide of the far post and beyond the reach of Kevin Ellis. Forward Soony Saad entered the match in the 77th minute and one minute later was nearly on the scoresheet when his cross from the right side of the area was deflected goalward and pushed away by Hamid at the last moment. D.C. United midfielder Alex Caskey was sent off in second-half stoppage time for a late challenge on Ellis, marking the fifth red card shown to a Sporting KC opponent in the past seven games. He will miss D.C. United’s match against the Columbus Crew next Saturday. Sporting Kansas City will remain on the road next week as the reigning MLS Cup champions travel to Houston for a rematch of the Eastern Conference championship at 7:30 p.m. on Friday at BBVA Compass Stadium. The match will air live on KCMI 38 the Spot and SKCTV. Sioux Falls, S.D. — Kansas City won the race to the rain-shortened finish line Sunday afternoon with a 3-2 victory over Sioux Falls in a game that began Saturday night but was suspended after three innings because of rain. With a 1-1 tie heading into the fourth inning when play resumed Sunday, the T-Bones took a 2-1 lead when Darrell Hudson dropped a two-out bunt that scored Vladimir Frias from third. Jared Messer (1-0), who took over Sunday for Saturday night’s starter Andy Noga, went four innings and allowed just one run, which came in the bottom of the fourth. He struck out four. Kansas City took the lead for good when Bryan Sabatella scored in the top of the eighth inning on a groundout from Danny Richar. Kris Regas (3) picked up the save with a scoreless ninth. The fourth and final game of the series, which would’ve been played later Sunday afternoon, was rained out. No make-up date has been announced. Kansas City (8-9) begins a seven-game homestand, its longest of the season, Monday with a four-game Kansas Turnpike Showdown against the Wichita Wingnuts. First pitch is scheduled for 7:05 p.m. Tickets are available by calling the Providence Medical Center Box Office at CommunityAmerica Ballpark at 913-328-5618.